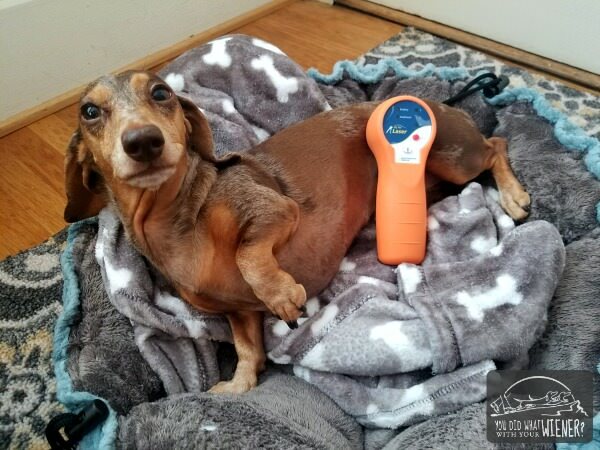 So you read my article about how cold laser therapy can help your pet with things like arthritis, ACL and other ligament tears, Intervertebral Disk Disease (IVDD) and other spine problems, general pain, healing wounds…. well, some claim a cold laser can cure about anything. Now you want to buy a cold laser for your dog but the information out there is overwhelming and sometimes conflicting. Lucky for you, I love gathering, gathering, gathering information and then boiling it down to something really simple. 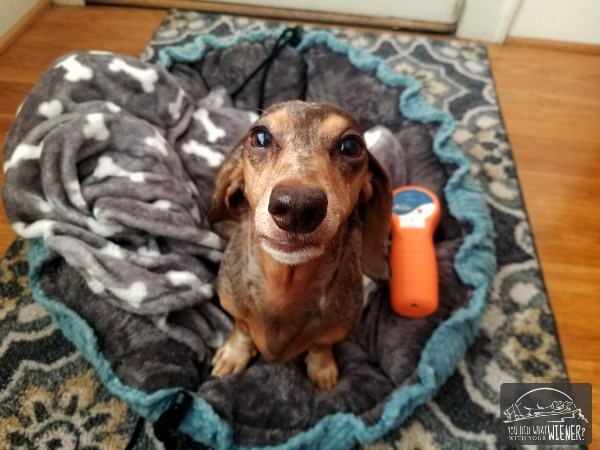 I’m no pet laser expert – I only recently started learning about them after Gretel injured her back, her initial rehab period was over, and I started looking at long-term management options. However, I did a ton of research over a few months and consulted with a few laser experts. Hopefully this “layman’s guide” will help you decide which cold laser is right for your dog. When evaluating a laser to purchase, basically there are five things you want to consider – classification, power (mW), wavelength (nm), frequency (Hz), size of the diode (area it can treat at once), and cost. What Do the Different Laser Classes Mean? When looking at different lasers, you will see their “class”. Lasers are classified according to power level. Basically, the class tells you how safe a laser is for home use. Safe here means the ability to do damage to eyes or tissue. Classes range from 1-4 (typically expressed in Roman numerals but not here for clarity) with some classes being broken into 2 sub-classes (example, 1 vs 1m or 3 vs 3b). Class 1 & 2 lasers can easily be purchased over-the-counter for home use. Because this classification is limited to a maximum power of 5mW continuous (they can go a bit higher than that if pulsed – see the section on frequency below), the risk is buying something that isn’t actually effective for treating your pet. However, effective class 1 & 2 lasers do exist. Class 3 lasers are designed for veterinary practitioners but can also be purchased for home use on pets and horses (these are not FDA approved to use on humans without a prescription). Class 3 lasers must be less than 500mW per laser diode continuous output. You can find some lasers that use multiple diodes, all under 500 mW, to increase the power or treatment area of the laser. If they are a class 3 or 3b laser, that means they have still been determined to meet the safety requirements of that category. There is a class 4 laser. Lasers in this class have one or more laser beams with an output of 500mW or more. Lasers in this class have potential to due damage to eyes or tissue if used improperly but you can still buy these for home use on pets. However, some pet laser expers warn to stay away from class 4 lasers because the potential to use them incorrectly, and cause damage, is too high. If you do choose to purchase a class 4 laser, it’s highly recommended that you get proper training on how to use it from your veterinarian. Class 4 lasers are so expensive though that most people are unlikely to be buying one for their pet. The bottom line: Lasers that range from class 1 to 4 can be purchased for home use on a companion animal (there are some FDA rules if you want to use it on humans too but many people do use the same laser for themselves as an “off label use”). However, class lasers can be dangerous if not used properly, and aren’t necessarily better, so stick with a class 1-3 laser. What Power Level Do I Need? The power of the laser doesn’t exactly correlate to effectiveness . The power just determines how long or short the treatment time is. A lower power laser will have to be used for 20-30 minutes while a high-powered laser can provide the same treatment in as low as 5-10 minutes. Conversely, a higher power laser used for the same amount of time will deliver more healing power. As you can imagine, when trying to treat a sometimes squiggly pet, a shorter treatment time – therefore, a higher power laser – is probably better. I could go into numbing detail but I’ll just say that a home-use laser can range from under 30 mW (some say that ones under 100 mW aren’t really effective though) to about 15,000 mW. The bottom line: As long as the laser is over 5 mW (so, not a laser pointer for your cat or computer), it will deliver some level of treatment. The higher power you go though, the shorter the treatment time and the more likely they are to be effective (if you have to use the laser for 20 minutes twice a day, you might be tempted to cut the treatment time short). What Wavelength Do I Need? The next thing to look for is the wavelength. This determines how deeply the laser will penetrate the skin and tissue. The shorter the wavelength, the shallower the treatment depth. Cold lasers for your dog typically range from 600 nm (red) to 980 nm. 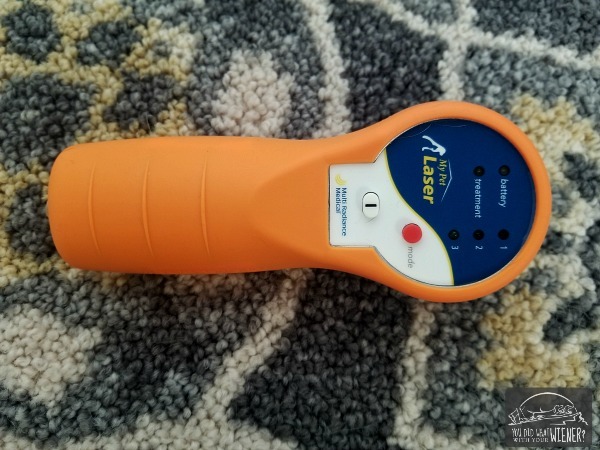 If you are buying a laser for your dog to help with a skin condition or wound, you can go with a laser that is closer to the 600-635 nm range. An interesting thing about lasers in this wavelength is that they are the most likely to put the energy “in the blood”. This energy can move around the body in the bloodstream and effect more systematic or complex issues. If you want to laser to treat deeper muscle tissue or joints but still offer surface-level cellular benefits, then a laser with a wavelength of 800 to 860 nm is ideal. If you are looking for one to treat only deeper level tissue and joint issues, you should go with a laser that is at least 905 nm. There is some controversy around laser wavelengths that are above 905 nm. The theory is that the extra wave “length” is absorbed by tissues and water enough that the longer wavelength doesn’t reach any deeper than a 905 nm and. In fact, some studies claim that it may not even reach as deep as a 905 nm wavelength (this is a totally non-sciency explanation of… a lot of science) . Some studies contradict that though. Just make sure the laser has a wavelength of 905 nm if you want deeper treatments. You are unlikely to find anything over 1080 nm for home use. Still confused about which wavelength you need? Luckily, there are some lasers out there that cover the whole range and have different settings depending on what you are treating at the moment. There are also some lasers, like the My Pet Laser, use multiple wavelengths at the same time. The Bottom Line: Figure out what condition(s) you want to treat and choose the appropriate wavelength. If you are unsure, or you want to treat multiple conditions, choose a laser with different modes or that use a combination of different wavelengths at the same time. How Much Does Frequency Matter? Lasers can operate continuously, pulsed or super pulsed. Only lasers that are “pulsed” will mention “Hertz” in their description. Hertz, or cycle per second of electromagnetic radiation, determines the frequency and duration of breaks in the laser beam emission. In other words, a pulsed laser “shoots” a beam into the skin at some frequency instead of constantly staying on. A continuous laser beam penetrates the skin and then, basically, remains on that spot. There is potential for the tissues to heat up in that area and cause damage. These lasers often have to be constantly moved by hand to prevent this. If a laser is pulsed, think of it as a cycle of hot, cold, hot, cold, hot, cold. The area gets a chance to cool between each heating “pulse”. Therefore, a pulsed laser can operate at a higher power (hotter) because there are little breaks that allow the area to cool. You may be able to leave a pulsed laser in one spot to deliver targeted treatment but be sure to read the manual to confirm. A super pulsed laser is essentially a pulsed laser that goes really, really fast. It combines the best of both of the above technologies – continuous and pulsed. This minimizes the heating-cooling cycle while still allowing for a high power diode to be used (doesn’t heat up the tissue). For example, Multi Radiance Super Pulsed lasers deliver a pulse at billionths of a second and a laser diode that can reach up to 50,000 mW of peak power. This delivers a higher concentration of light energy, or photons, deeper into the target tissue, without any risk of over-heating. Bottom Line: Continuous, pulsed, and super pulsed lasers are all effective for treatment. However, super pulsed lasers are the best because they deliver a maximum treatment power and effectiveness while reducing the risk for over heating and damaging the tissues. Does the Size of the Laser Diode Matter? I didn’t see this point emphasized in most literature I reviewed about lasers. However, it is worth noting. If the laser has only one diode, it’s diameter is somewhat relevant. Some diodes are only 1/2 inch in diameter and some are closer to 2 inches. It makes sense that a larger diameter diode will cover a larger treatment area if applied to the skin in one spot. However, most lasers are used by “sweeping” them over the treatment area so you can really cover the same area with both pretty easily. Where it might matter is if you are using it to trigger acupuncture points (very specific points on the body). If the laser has multiple diodes, the size of each diode matters less. Four 1/2 inch diodes can cover a similar area as a single 2-inch diode. The bottom line: Look at the description for information about the size of the treatment area rather than getting hung up on the size of the laser diodes. How Much Can You Spend on a Laser? You’ll obviously need to think about, or “justify”, how much you’re willing to spend on a cold laser unit. Here are some things I considered. How many pets will you use it on? – This matters when estimating what the cost would be if you choose to get treatments through your veterinarian. Obviously, treating more pets will be more expensive. How many treatments a month do you want to give them? – During Gretel’s rehab period, it was recommended that she get 2-3 laser treatments a week. One treatment per week was the minimum recommended when she was in active recovery. The chances are that you would get similar recommendations for your pet but it’s not a bad idea to ask a veterinarian who works with cold lasers. What is the going rate for cold laser treatments by veterinarians in your area? Call around and find out what the average cost of a laser treatment is in your area. What would it cost if you DON’T buy it? This is where we get down to the math of it all. Multiply the number of pets you will treat by the number of treatments you plan to give them a month. Multiply that by the going rate in your area for one laser treatment. If you are going to give maintenance treatments all-year long, multiply that number by 12 months (most quality lasers will last 5 years or more). For example, laser treatments at Gretel’s rehab vet is about $50 per treatment. If I took both dogs in for only 2 treatments a week, that would be 16 treatments a month, or approximately $800 a month. If I gave them treatment year-round, I would spend $9,600. What are you willing/able to invest? – Now you have an idea of what you would spend if you didn’t buy a laser for home use. Chances are, it’s more money than you are happy about parting with. However, it gives you some perspective. 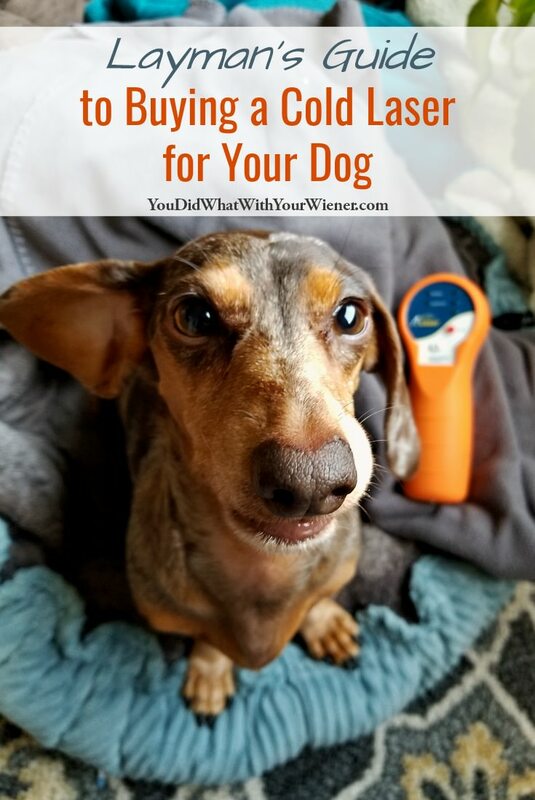 The cost of the laser you purchase, ideally, will fall in between what you can easily afford and what it would cost if you sought treatments through a veterinarian. Will insurance cover any of the cost? – I have pet health insurance that will cover cold laser therapy. The catch is that it has to be prescribed by a veterinarian and the treatments performed in a clinical setting. Technically, according to my policy, it will not cover the purchase of a laser. That means that much of my costs to get Chester and Gretel treated with laser at the vet (and maybe a rental from a veterinarian for use at home) is likely covered by insurance but I’m on my own if I want to buy a laser. However, your pet insurance might . It doesn’t hurt to ask. Intangible factors to consider – there are other things you need to consider too like accessibility and convenience. Perhaps there are not any veterinarians in your area that offer laser treatments. Also, traveling an hour or more to the vet for each treatment is more time consuming than delivering a similar treatment at home in 10 minutes. What is the time savings worth to you? The bottom line: Buy the highest power laser you can, with the most appropriate treatment wavelength for the condition you are treating, that is within your budget. When it came to price – using my example above – it would cost me $9,600 a year to treat both Chester and Gretel at home at 2 treatments a week (I want to treat them at least 4 days a week though). If I treated them for 5 years (how long a quality laser usually lasts – sometimes they last longer) , getting a laser could save me up to $48,000. CHOKE! *Ahem* There is no way I could pay that much. Ever. As far as convenience, that was a no-brainer. First, we travel a lot. Whether it be driving for hours back and forth to trails, camping trips in the woods, or traveling to other states. we are away from home often. The ONLY solution for us is for me to have my own laser unit so I can give them treatments no matter where we are at or what time of day it is. When it came to power level, I wanted to get the highest power laser that I can for what I can afford. I’m a busy dog Mom, and Chester and Gretel are wiggly during treatments, so being able to deliver a treatment in the shortest amount of time possible is ideal. I also wanted a laser with a low, or non existent, risk of injury. That meant I was likely going to want a super pulsed laser. I wanted a laser that used multiple wavelengths so I could treat different things over time. I did finally decide on a laser and purchase one to use on Chester and Gretel at home. Disclaimer: I was given a discount on the My Pet Laser rental and purchase in exchange for sharing my experience with you guys. Uses 3 different wavelengths simultaneously – Red-660 nm, Infrared-875 nm and Super Pulsed Laser-905 nm – to reach different tissue levels. It has 3 different frequency settings depending on what condition you are treating. At a cost of $2,995.00, it was significantly less than my $9,600 a year for vet treatments. Over a 5-year period, getting this laser would save me $45,000! It was still way more than I was willing to spent before trying it. I had met Dr. Youkey at a conference and knew that she was a rental and sales rep for the laser. She is one of the experts I consulted with when writing this article. Dr. Youkey is a leading Veterinary Adviser for Multi Radiance Medical & a Mobile Veterinarian. She received her Doctorate in Veterinary Medicine from Colorado State University, has over 38 years of veterinary industry background, lectures worldwide teaching other vets about laser therapy, and is leading the field by introducing Laser-Puncture to the veterinary industry. I contacted her at Laser-riffic.com to rent the My Pet Laser for 3 weeks to try it out. She was very patient and answers every one of my 100 questions (that’s what it felt like anyway). We talked about Chester and Gretel’s conditions and she explained to me how to properly use the laser. Note: If you want to rent My Pet Laser to try it out, contact Dr. Youkey at Laser-riffic.com. If you already know you want one, you can use the code LONGBACKS to get $125 off of the retail price of the laser. Have you considered buying a cold laser for your pet? Your PetLaser article has really helped me a lot. I live in Korea, and my dogs are kidney failure. So they can not easily use antibiotics, and they are also 15 years old. So I was looking for something to improve their inflammation and pain. Cold laser was found through the search. I tried acupuncture to them through a veterinarian to reduce their pain. But it works pretty well, and about $ 100 one-time costs. The cost is too expensive for me. So I read your article many times. I want to buy the same model as you, but the cost is too expensive. So I found the model in the url below. I do not speak English well, I search, but I do not know if this product will work for my dogs. As a person who has experienced home laser first, can you give me advice? Korea has some of the lasers in the hospital, but it is still in its infancy. In Korea, there are still few people who buy cold lasers for dogs. So I have no place to seek advice. Have a great day and I wish you and your dogs health and happiness. I received your email and replied. I hope you got it. Good luck! Can we hire these in the UK and is the voltage the same. Hi Darren. I’m not familiar with cold lasers in the UK. I assume you can purchase them for home use just as you can in the US and I am almost positive that some veterinarian there can perform the procedure. I’m assuming you could charge a laser with a US plug in the UK using an adapter but I would definitely check with the manufacturer (or find one that already has a UK plug) because it’s definitely not worth risking ruining it. Thank you so much for your article. I have 2 older cats with crippling arthritis. After reading your article I rented the laser from my vet and have used it 10 days. I can already see that my cats are walking better- more upright and faster. The one cat even climbed the steps today which she hasn’t done in over a year. Here’s my problem. I just cannot afford the weekly rental fees. Why is it SO expensive? After reading about you and your dogs, I am thinking about getting a loan to buy the blue My Pet Laser. Do you know the cheapest place to get one? Or a cheaper place (than my very expensive vet’s office) to rent one? Thank you for your article. I feel like I’m on the right track now and see that my cats are actually feeling and moving better. Also…..the vet office did not give me goggles to wear while I do the laser on my cats. Do I need them with My Pet Laser? Hi Janet. I’m happy to hear that the laser worked for your cats but can totally empathize about the cost. I paid for about 10 laser sessions at the vet for my dog and it was over $800. Yikes! Investing in a My Pet Laser has definitely paid off for us in the long run. Unfortunately, I don’t know where to get a deal on one. They are high quality so I don’t think they run specials or anything. However, I would highly suggest contacting Dr. Youkey as asking her if she knows of any discounts or available payment plans. You can contact her here: https://www.laser-riffic.com/Contact-Us.html. Tell her that Jessica from YouDidWhatWithYourWiener.com sent you. As for the goggles, My Pet Laser came with them for me (which I don’t wear, I just don’t look at the beam) but not one for my dogs. Because of the laser classification, and the way the laser is used on pets, goggles for them are not required. You can always buy a cheap pair if you want to be extra cautious though. I would check PetSmart for their generic brand or check out “Doggles”. Good luck.